OBJECTIVE: To analyze the real-world dosing patterns of the 3 medications approved by the US Food and Drug Administration for fibromyalgia—pregabalin, duloxetine, and milnacipran. METHODS: Using QuintilesIMS’ (now IQVIA) electronic medical record data linked to administrative claims, we identified adults with fibromyalgia who were newly prescribed pregabalin, duloxetine, or milnacipran between January 1, 2006, and December 31, 2014. We summarized and compared the starting and maximum doses with United States prescribing information (USPI) dosing recommendations. RESULTS: In all, 1043 patients who were receiving pregabalin, 1281 receiving duloxetine, and 326 patients receiving milnacipran with similar age and comorbidity profiles were included in the study. The mean starting dose was 176 mg daily, 56 mg daily, and 95 mg daily for pregabalin, duloxetine, and milnacipran, respectively. More patients receiving pregabalin (35%) had a starting dose lower than recommended compared with patients receiving duloxetine (7%) or milnacipran (17%; P <.0001). 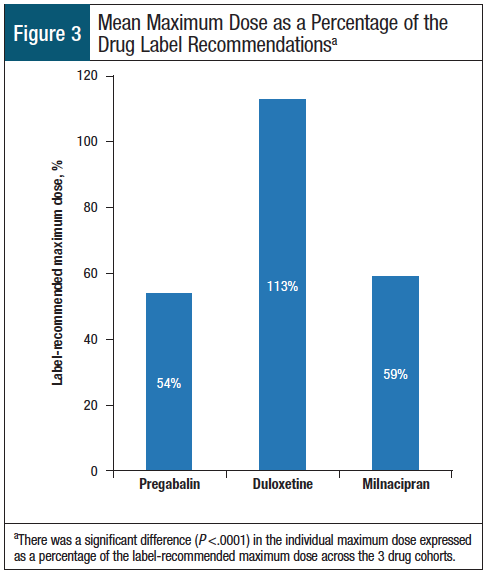 Of the patients who received pregabalin, 27% had USPI-recommended maintenance dosing versus 91% of patients who received duloxetine and 80% who received milnacipran (P <.0001). The mean duration of treatment was longer for duloxetine (205 days; P <.0001) than for pregabalin (167 days) and milnacipran (167 days). The duration of using the maximum dose of each medication as a percentage of the total time of medication use was 77% for pregabalin, 84% for duloxetine, and 90% for milnacipran (P <.0001). CONCLUSIONS: Patients using pregabalin were the most likely of the 3 cohorts to receive lower than label-recommended starting doses and the least likely to receive the recommended maintenance doses during follow-up compared with those receiving duloxetine or milnacipran. Real-world prescribing patterns indicate that factors other than label recommendations may be influencing prescribed dosing. Data on the dosing patterns of these 3 medications in real-world practice are limited. It is important to assess how dosing patterns align with FDA-approved dosing instructions to understand how well these medications are meeting patients’ needs, and whether the current dosing recommendations are being followed in real-world practice. The objective of this study was to ex­amine the real-world dosing patterns of the 3 FDA-approved medications in patients with fibromyalgia who use these medications. This retrospective cohort study used QuintilesIMS' (now IQVIA) electronic medical record (EMR) data linked to administrative claims from the Truven Health MarketScan Commercial database between January 1, 2005, and December 31, 2015. This EMR is compliant with the Health Insurance Portability and Accountability Act of 1996 and includes deidentified patient data from ambulatory care records obtained from a national network of primary care practices. The clinical data include activity from more than 38 million patients from 49 states. The EMR database includes patients with commercial insurance and Medicare and provides a longitudinal medical record for each patient containing diagnoses, prescribed medications, and laboratory test results from reporting physicians. Employers and health insurance companies contribute to the MarketScan claims data, which contain service-level detail regarding inpatient and outpatient medical services and outpatient prescription drugs. The linked EMR-claims data source provides information from EMRs and medical claims records on the key variables of demographics, clinical characteristics, International Classification of Diseases, Ninth Revision, Clinical Modification (ICD-9-CM)–based medical diagnoses, insurance information, and prescription details. Eligible patients had a new prescription for ≥1 of the 3 FDA-approved medications between January 1, 2006, and December 31, 2014 (the date of first prescription was used as the index date), without evidence of that medication during the preceding 12 months (ie, the baseline period). In addition, patients had to be aged ≥18 years, have a diagnosis of fibromyalgia (ICD-9-CM code 729.1) in claims or the EMR data within 30 days before the index date or any time after the index date, and be continuously enrolled in the health plan during the 12-month baseline and 12-month postindex periods (Figure 1). The patients were classified into 3 cohorts based on their index fibromyalgia medication of pregabalin, duloxetine, or milnacipran. Patients who had cancer during the baseline period or those who received ≥2 FDA-approved medications for fibromyalgia at index were excluded. However, patients were allowed to receive an additional FDA-approved medication or to switch to an alternative medication during follow-up. During the baseline period, the patients were allowed to be prescribed 1 of the FDA-approved medications for fibromyalgia, as long as they did not have a corresponding diagnosis of fibromyalgia within 30 days. The treatment duration of the index drug was calculated as the number of days from the index date up to and including the last day of supply for the last prescription dispensed. Dosing information was gathered from pre-scription claims data, which was calculated as dose strength multiplied by quantity dispensed divided by the days of supply. 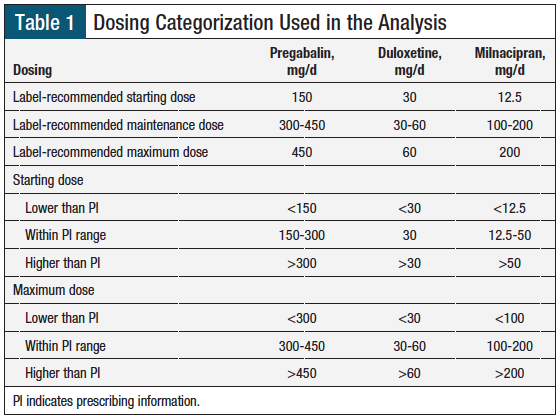 The starting dose and maximum dose received during study follow-up were summarized and compared with US prescribing information (USPI) dosing recommendations (Table 1). The maintenance dose was measured based on the dosing information for all prescription claims except the first prescription during follow-up. It is recommended to do a 1-day titration with milnacipran,6 which is often combined with the initial prescription for milnacipran; therefore, the exact starting dose may be underestimated for milnacipran. Patients prescribed the titration pack for milnacipran (NDC 0456-1500-55) were assumed to receive the USPI-recommended starting dose. The doses were categorized as lower than, within, or higher than the USPI recommendations for each of the 3 index medications (Table 1). Dosing was defined as unknown if the number of days for the prescription was unknown, the daily dose exceeded 10 times the label-recommended maximum, the dose was less than 10% of the label-recommended minimum dose, or the dose strength was unknown. Statistical analyses were performed using SAS version 9.4 maintenance release 3 and SAS/STAT version 14.1 (SAS Institute, Inc; Cary, NC). Descriptive analyses of all the study measures were performed across the medication cohorts. The patients' demographics and other clinical characteristics, as well as their treatment patterns (ie, dosing and duration), were described as counts and percentages for categorical variables and mean ± standard deviation (SD) for continuous variables. The differences between the 3 cohorts were examined using Monte Carlo approximation or Fisher's exact test and analysis of variance for continuous variables. All statistical tests were performed assuming 2-sided alpha of 0.05. Appendix 1 lists the diagnosis codes used to determine the comorbidities and Appendix 2 lists the medications in each drug class category. We identified 7519 patients with a diagnosis of fibromyalgia and a new prescription for 1 of the 3 FDA-approved medications (ie, pregabalin, duloxetine, or milnacipran) between January 1, 2006, and December 31, 2014, who did not have evidence of that medication during the 12-month baseline period. Of the 7519 patients, 2650 met all the study inclusion criteria. These patients were further stratified into 3 cohorts, including pregabalin (N = 1043), duloxetine (N = 1281), and milnacipran (N = 326), for analysis (Figure 1). The demographic characteristics of the study cohorts are shown in Table 2. Across cohorts, the mean age was 50 years (SD, 12 years), with a plurality of 45 to 54 years. More than 90% of each cohort had commercial insurance, and the majority of the patients were white and from the South region. The demographic characteristics were similar across the 3 fibromyalgia medication cohorts, except for a higher proportion of female patients in the milnacipran cohort (95%) than in the pregabalin and duloxetine cohorts (87% and 89%, respectively; P <.05). 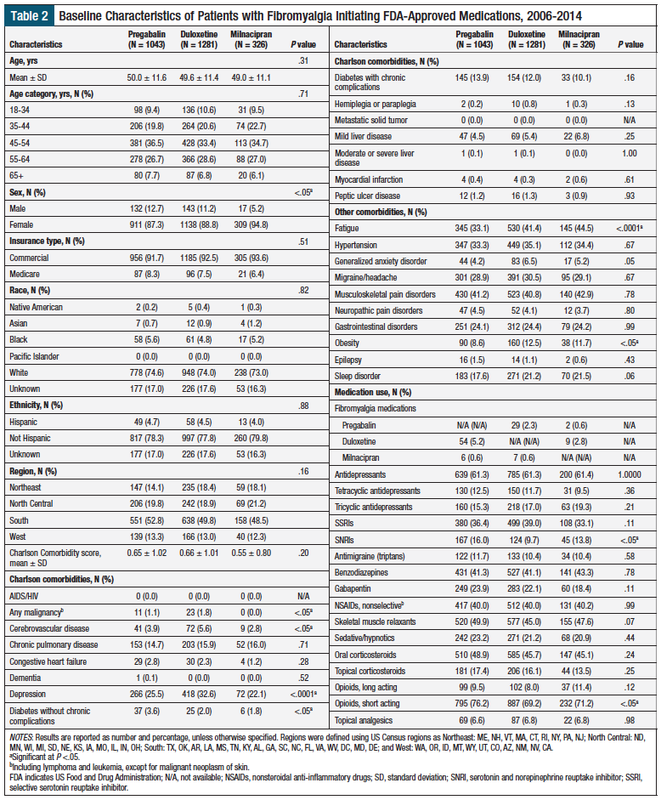 The Charlson Comorbidity score was similar across the 3 fibromyalgia medication cohorts (Table 2), with a mean score of 0.65 (SD ± 1.02) for pregabalin, 0.66 (SD ± 1.01) for duloxetine, and 0.55 (SD ± 0.80) for milnacipran. The most frequently observed comorbidities during the baseline period were depression, other musculoskeletal pain disorders, sleep disorders, fatigue, hypertension, migraine or headache, and gastrointestinal disorders. The use of antidepressants, benzodiazepines, nonselective nonsteroidal anti-inflammatory drugs, musculoskeletal relaxants, oral corticosteroids, and short-acting opioids in the 12 months before the index fibromyalgia medication was common (Table 2). During the baseline period, a significantly higher percentage of patients in the pregabalin cohort received short-acting opioids (76.2%) compared with duloxetine (69.2%) and milnacipran (71.2%; P <.05). Between 18% and 24% of patients had received gabapentin in the 12 months before the index fibromyalgia medication date. 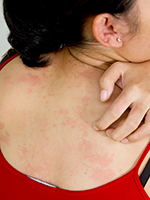 The use of a fibromyalgia medication other than the index drug during baseline was low. The starting, maintenance, and maximum doses for the 3 index drugs were available for almost the entire patient sample (96% overall). The mean treatment duration was significantly longer for duloxetine (205 days; SD, 146 days) than for pregabalin (167 days; SD, 141 days) and milnacipran (167 days; SD, 143 days; P <.0001). The mean starting doses were 176 mg daily (SD, 220 mg/d) for pregabalin, 56 mg daily (SD, 64 mg/d) for duloxetine, and 95 mg daily (SD, 97 mg/d) for milnacipran. 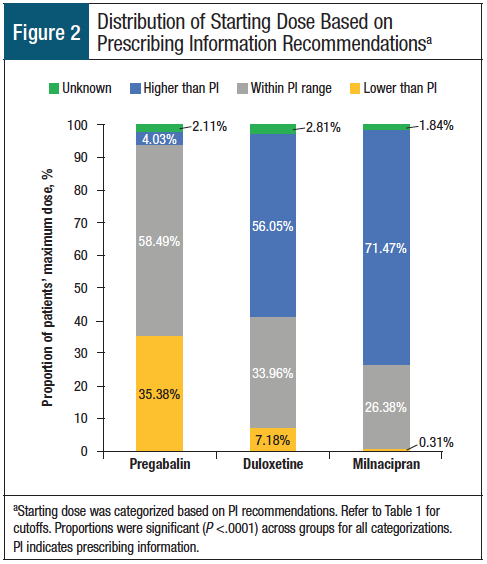 A significantly higher proportion of patients receiving pregabalin (35%) were prescribed a starting dose lower than is recommended by the USPI compared with milnacipran (0.31%) and duloxetine (7%; Figure 2). Only 27% of the patients who received pregabalin were prescribed a maintenance dose within the USPI-recommended maintenance range at any point during follow-up compared with 91% of the patients who received duloxetine and 80% of the patients who received milnacipran (P <.0001). In addition, patients who used pregabalin received a dose that was consistent with the USPI maintenance dose recommendations for a significantly lower percentage of the time they used pregabalin (69% of days; SD, 30%) compared with duloxetine (92% of days; SD, 20%) and milnacipran (94% of days; SD, 16%; P <.0001). 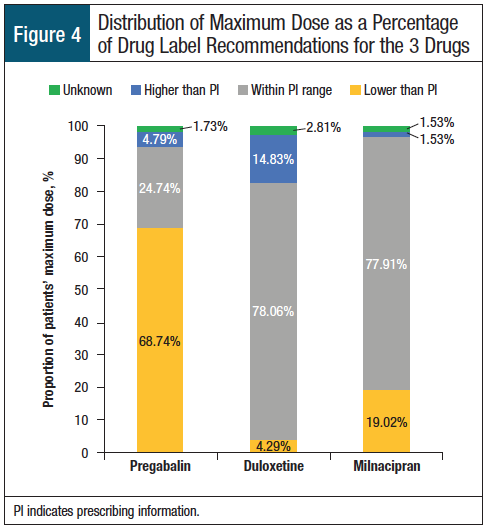 The mean maximum dose prescribed to patients as a percentage of the USPI maximum recommended dose was 54% for pregabalin (242 mg/d ± 310 mg/d), 113% (68 mg/d ± 73 mg/d) for duloxetine, and 59% (119 mg/d ± 135 mg/d) for milnacipran (P <.0001; Figure 3). Among the 3 drugs, duloxetine had a significantly higher volume of patients being prescribed above 100% of the label-recommended maximum dose, with approximately 15% of patients receiving doses of ≥100%, and nearly 10% of patients receiving doses between 175% and 200% of the label-recommended maximum dose (Figure 4). A greater proportion of patients who used duloxetine (15%) received doses above the USPI-recommended maximum dose than those who received pregabalin (5%) or milnacipran (2%; P <.0001). Similar to the maintenance dose, patients who used pregabalin received a maximum dose for a lower proportion of the time (77% ± 31%) compared with patients who used duloxetine (84% ± 26%) or milnacipran (90% ± 22%; P <.0001). Our findings showed that patients frequently receive FDA-approved fibromyalgia treatments at doses that are not concordant with the drug label recommendations. Only approximately 34% of patients were prescribed FDA-approved drugs for fibromyalgia at the recommended starting dose. The initial underdosing was more common among patients who were prescribed pregabalin than in those who were prescribed duloxetine or milnacipran, despite similar baseline demographics and comorbid conditions. Patients who received pregabalin were also the least likely among the 3 cohorts to be prescribed the USPI-recommended maintenance dose at any point during follow-up compared with patients who received duloxetine or milnacipran, and they also had shorter treatment durations of the maximum dose. Although these findings may suggest that many patients who received pregabalin were underdosed according to the label recommendations, the appropriate dose of fibromyalgia medications can be individualized to optimize the benefits and reduce side effects. Even when patients who received pregabalin were prescribed doses in the recommended maintenance range, we found that the duration of time spent at that recommended maintenance dose was significantly shorter compared with patients who were prescribed duloxetine or milnacipran. It is possible that patients’ tolerability of pregabalin may have prevented staying at the recommended maintenance dose for an extended period of time, but we could not confirm this in the absence of additional clinical information in the database. Further research is warranted to examine this topic and expand on the differences in the use of maintenance dosing between pregabalin, duloxetine, and milnacipran. Because many patients with fibromyalgia are receiving multiple medications to manage their disease, medication duration and adherence may be affected by complicated polypharmacy regimens.13,14 Consistent with findings from other studies,15-18 opioid utilization was high in our study sample, and patients who received pregabalin had the highest frequency of short-acting opioids use. Opioids are not recommended by the American College of Rheumatology for the treatment of fibromyalgia.19 The impact of opioid use on dosing, duration, and adherence for fibromyalgia medications warrants further investigation. Patients with fibromyalgia have considerable comorbidities and medication burden.16,18,20 The presence of comorbid conditions may complicate the management of patients with fibromyalgia. The FDA-approved fibromyalgia medications also have multiple indications, with different dosing recommendations. These 2 factors have made assessing the appropriateness of fibromyalgia medication dosing a challenging task. For example, the maximum recommended dose for duloxetine for depression is 120 mg daily (double that of the recommended maximum dose for fibromyalgia).5 In our study, the mean individual maximum dose for patients receiving duloxetine was 113% of the label-recommended maximum dose for fibromyalgia, and duloxetine doses as high as 200% of the recommended dose for fibromyalgia were prescribed for some patients. Approximately 33% of the patients with fibromyalgia who were prescribed duloxetine had comorbid depression, and 7% had generalized anxiety. It is possible that higher doses of duloxetine were used for the treatment of depression in these patients with fibromyalgia. This study is subject to limitations that are common to retrospective analyses of secondary data, including possible missing data, coding errors, and the fact that the data were not collected for research purposes. In addition, because the EMR system includes ambulatory practice data only, we are unable to analyze data from patients in the inpatient setting or in other facilities, such as long-term care or other settings where patients with fibromyalgia may seek treatment. Although we identified differences in the prescribing patterns based on these data, we lack the ability to ascertain the reasons behind the differences in the prescribing patterns; future studies would be needed to examine the reasoning. We identified patients who were newly initiating fibromyalgia medications via prescription claims records, and we excluded patients who had evidence of the use of index fibromyalgia medications in the previous 12-month period. It is possible that patients might have used their index medication before the 12-month baseline or have received a sample of the medication that was not recorded in our data set. The previous use of index medication may bias the starting dose observed in our analysis. In addition, although our inclusion criteria preclude patients' use of 2 or more FDA-approved medications at index, patients were permitted to initiate other fibromyalgia medications during the study period. Furthermore, the use of nonpharmacologic treatment is common in patients with fibromyalgia.21,22 Any changes in nonpharmacologic treatment during the study period might also have affected the effectiveness of fibromyalgia medications and the dosing patterns. In addition, the use of prescribed medications that were paid in cash (eg, generics) would not appear in the claims data, and may therefore be underreported. Future studies considering these potential confounders are warranted to confirm our study findings. This study explored real-world dosing patterns of the 3 FDA-approved medications for fibromyalgia in comparison with the recommended dosing instructions. Many patients with fibromyalgia did not receive the recommended dosage of fibromyalgia medications, which was most pronounced among patients receiving pregabalin. Information regarding the real-world dosing of fibromyalgia medications is critical to understanding the effectiveness and use patterns of those medications. These data indicate that real-world prescribing patterns may be driven by factors other than recommended dosing. The reasons for this discordance should be elucidated in future investigations. Funding for this study was provided by Daiichi Sankyo. Dr White and Mr Niemira reported no conflicts of interest; Dr Kwong is an employee of Daiichi Sankyo; Dr Armstrong is a consultant to and Mr Behling is an employee of IQVIA; Dr Lang received funding from Daiichi Sankyo. Dr White was Engagement Manager, IQVIA, New York, NY; Dr Kwong is Executive Director, HEOR, Daiichi Sankyo, Basking Ridge, NJ; Dr Armstrong was Scientific Advisor, IQVIA; Mr Behling is Research Associate, IQVIA; Mr Niemira is Senior Statistician, IQVIA; Dr Lang was Principal, IQVIA, during the study. 1. Ngian GS, Guymer EK, Littlejohn GO. The use of opioids in fibromyalgia. Int J Rheum Dis. 2011;14:6-11. 2. Vincent A, Lahr BD, Wolfe F, et al. 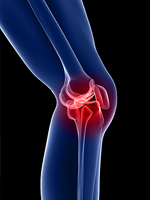 Prevalence of fibromyalgia: a population-based study in Olmsted County, Minnesota, utilizing the Rochester Epidemiology Project. Arthritis Care Res (Hoboken). 2013;65:786-792. 3. Centers for Disease Control and Prevention. Fibromyalgia. Updated April 3, 2018. www.cdc.gov/arthritis/basics/fibromyalgia.htm. Accessed March 30, 2017. 4. Lyrica (pregabalin) capsules, CV/oral solution, CV [prescribing information]. New York, NY: Pfizer; May 2018. 5. Cymbalta (duloxetine delayed-release capsules) for oral use. Indianapolis, IN: Eli Lilly; December 2017. 6. Savella (milnacipran HCl) tablets [prescribing information]. Irvine, CA: Allergan; December 2017. 7. Häuser W, Petzke F, Sommer C. Comparative efficacy and harms of duloxetine, milnacipran, and pregabalin in fibromyalgia syndrome. J Pain. 2010;11:505-521. 8. Clauw DJ. Fibromyalgia: a clinical review. JAMA. 2014;311:1547-1555. 9. Hassett AL, Gevirtz RN. Nonpharmacologic treatment for fibromyalgia: patient education, cognitive-behavioral therapy, relaxation techniques, and complementary and alternative medicine. Rheum Dis Clin North Am. 2009;35: 393-407. 10. Charlson ME, Pompei P, Ales KL, MacKenzie CR. A new method of classifying prognostic comorbidity in longitudinal studies: development and validation. J Chronic Dis. 1987;40:373-383. 11. Moore RA, Straube S, Wiffen PJ, et al. Pregabalin for acute and chronic pain in adults. Cochrane Database Syst Rev. July 2009:CD007076. 12. Liu Y, Qian C, Yang M. Treatment patterns associated with ACR-recommended medications in the management of fibromyalgia in the United States. J Manag Care Spec Pharm. 2016;22:263-271. 13. Yang M, Qian C. Treatment patterns highlight unmet needs in the management of fibromyalgia in the United States. Value Health. 2014;17:A230. 14. Sun P, Peng X, Sun S, et al. Direct medical costs and medication compliance among fibromyalgia patients: duloxetine initiators vs. pregabalin initiators. Pain Pract. 2014;14:22-31. 15. Sun P, Zhao Y, Zhao Z, Watson P. Medication dosing patterns associated with duloxetine and pregabalin among patients with fibromyalgia. Curr Med Res Opin. 2011;27:1793-1801. 16. Kim SC, Landon JE, Solomon DH. Clinical characteristics and medication uses among fibromyalgia patients newly prescribed amitriptyline, duloxetine, gabapentin, or pregabalin. Arthritis Care Res (Hoboken). 2013;65:1813-1819. 17. Wu N, Chen S, Boulanger L, et al. Average daily dose, medication adherence, and healthcare costs among commercially-insured patients with fibromyalgia treated with duloxetine. Curr Med Res Opin. 2011;27:1131-1139. 18. Gore M, Tai KS, Chandran A, et al. Clinical comorbidities, treatment patterns, and healthcare costs among patients with fibromyalgia newly prescribed pregabalin or duloxetine in usual care. J Med Econ. 2012;15:19-31. 19. American College of Rheumatology. Fibromyalgia. Updated March 2017. www.rheumatology.org/I-Am-A/Patient-Caregiver/Diseases-Conditions/Fibromyalgia. Accessed July 19, 2018. 20. Arnold LM, Hudson JI, Keck PE, et al. Comorbidity of fibromyalgia and psychiatric disorders. J Clin Psychiatry. 2006;67:1219-1225. 21. Häuser W, Jung E, Erbslöh-Möller B, et al. The German fibromyalgia consumer reports - a cross-sectional survey. BMC Musculoskelet Disord. 2012;13:74. 22. Robinson RL, Kroenke K, Williams DA, et al. Longitudinal observation of treatment patterns and outcomes for patients with fibromyalgia: 12-month findings from the reflections study.Pain Med. 2013;14:1400-1415. PROVIDERS: In many chronic conditions with comorbidities, such as fibromyalgia, providers must balance their decision-making and ultimately focus on patient care outcomes. Data-derived insights that illustrate the concerns about drug use fundamentals, such as dosing, should be a wake-up call when making prescribing decisions. Inefficient and ineffective dosing is an issue that can be addressed by all care providers, including physicians and pharmacists. The implications of such measures include improved and measurable clinical outcomes, which can engage patients positively to maintain adherence to appropriately prescribed medications. However, often the healthcare insurance coverage conundrums may negatively affect the balanced practice of provider prescribing. Patients’ out-of-pocket costs, step therapy, or preferred drug requirements could be areas of future study to optimize prescribing decision-making and positively guide proper dosing. PATIENTS: Chronic conditions include multiple symptoms with comorbidities that need to be effectively managed by providers using a personalized treatment strategy that is in sync with the individual patient. Without achieving effective drug dosing to ameliorate symptoms or stop disease progression, patients can be less likely to adhere to their medication therapies. Such patient nonadherence could result from a perceived lack of medication effectiveness or lack of improvement in their clinical condition, as well as from unreported side effects at higher doses. Nonadherence may also result from out-of-pocket costs at a higher dose or greater frequency, which causes patients to limit medication use at proper dosing. From the start of treatment, proper medication dosing is critical to achieving effective patient outcomes, as demonstrated in phase 1, 2, and 3 clinical trials conducted with drugs to obtain US Food and Drug Administration approval. Insurance coverage considerations of a drug should include any potential impact of the drug cost, including but not limited to out-of-pocket cost, on patient medication use patterns. Real-world studies of prescribing patterns and real-world utilization data can inform improved actions that support optimal patient care incentives or disincentives. 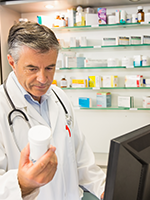 PURCHASERS/PAYERS: The need to avoid inappropriate medication prescribing includes a wide spectrum of issues—with fibromyalgia, that includes the use of opioids, which are not a recommended treatment option for this chronic disease. Purchasers can be more aligned with patients by seeking optimal outcomes from drug therapies over the long-term versus having a single fiscal year mentality. Resulting in part from third-party payers who are incentivized to manage economics considerations primarily, purchasers who are seeking long-term benefits from their investments in medication use could do a better job of allowing for the optimization of drug therapies at the provider–patient interface. Designating more effective metrics that are meaningful and actionable could lead to desired real-world prescribing patterns thanks to improved execution of benefit design throughout the healthcare system. 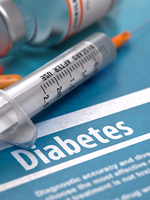 More studies that will elucidate real-world data on chronic condition treatments can go a long way to help providers, patients, and payers to improve healthcare system efficiencies. In addition, such studies could inform benefit structure or design considerations that support optimal health plan performance that is driven by purchasers. Furthermore, such efforts can begin to address more effectively drug use fundamentals, such as dosing, that are associated with gaps that need to be resolved. F. Randy Vogenberg, PhD, RPh is Principal, Institute for Integrated Healthcare and Board Chair, Employer-Provider Interface Council of the Hospital Quality Foundation, Greenville, SC. 1. White C, Kwong WJ, Armstrong H, et al. Analysis of real-world dosing patterns for the 3 FDA-approved medications in the treatment of fibromyalgia. Am Health Drug Benefits. 2018;11(6):292-301.